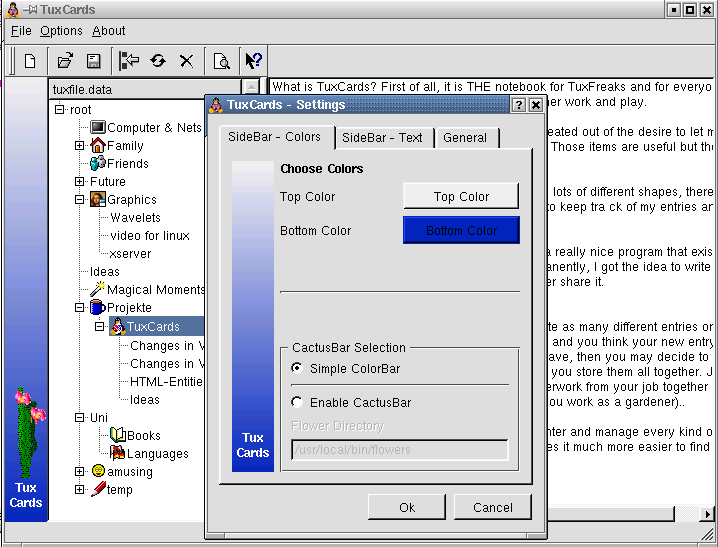 Home » Office , Utility » TuxCards is a hierarical notebook - similar to CueCards - that enables you to organize and sort every kind of entries within a tree-structure. TuxCards is a hierarical notebook - similar to CueCards - that enables you to organize and sort every kind of entries within a tree-structure. 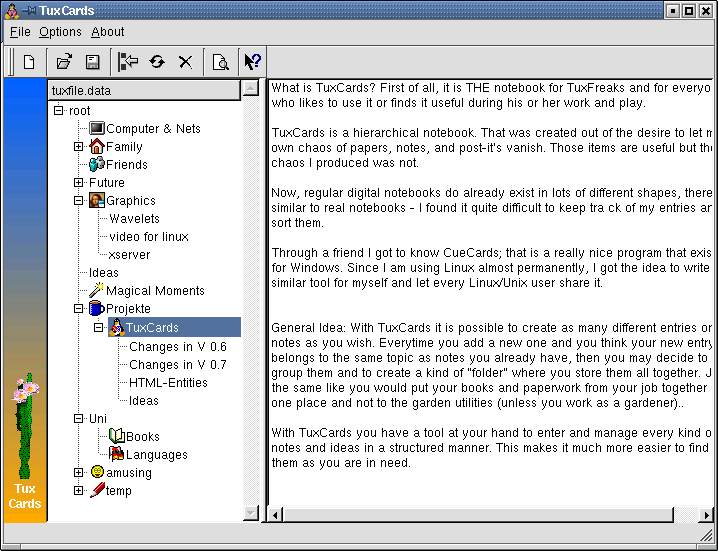 TuxCards is a hierarchical notebook to enter and manage ever every kind of notes and ideas in a structured manner. It was created out of the desire to let my own chaos of papers, notes, and post-it's vanish. Now, regular digital notebooks do already exist in lots of different shapes, there - similar to real notebooks - I found it quite difficult to keep track of my entries and to sort them. Through a friend I got to know CueCards; this is a really nice program that exists for Windows. Since I did use Linux almost permanently, I got the idea to write a similar tool for myself and let every Linux/Unix user share it. With TuxCards it is possible to create as many different entries or notes as you wish. Everytime you add a new one and you think your new entry belongs to the same topic as notes you already have, then you may decide to group them and to create a kind of "folder" where you store them all together. Just the same like you would put your books and paperwork from your job together in one place and not to the garden utilities (unless you work as a gardener). With TuxCards you have a tool at your hand to enter and manage every kind of notes and ideas in a structured manner. This makes it much more easier to find them as you are in need. To get a picture or a feeling about what I mean, look at the images below. I did not only want to write and sort my notes in some tool or boring program. Hence, to make the process enjoyable I've added Cactus-Support (beginning with Version 0.7). This means the user has the possibility to enable the Cactusbar to let grow some random cactuses while he/she is using TuxCards. Notes can be composed using richtext elements including images. Create PDF-documents from individual entries. TuxCards might be used with a translation for your own language (if available). At every start, the application will automatically load your last data. The tree-structure's state is restored as it was left at your last saving. Drag & Drop of entries between completely different TuxCards applications is possible. Saved files have an XML-based format to guarantee interoperability. Command line options (start with tuxcards -h). As prerequisite the Qt library in version 4.6 is needed. TuxCards 2.2.1 did run successfully over an extended period of time on Mac OS X (Leopard) with qt4.6.3 and WinXP (qt4.6). Please report bugs to tuxcards(at)gmx.net. Follow this link to download a Previous Version.